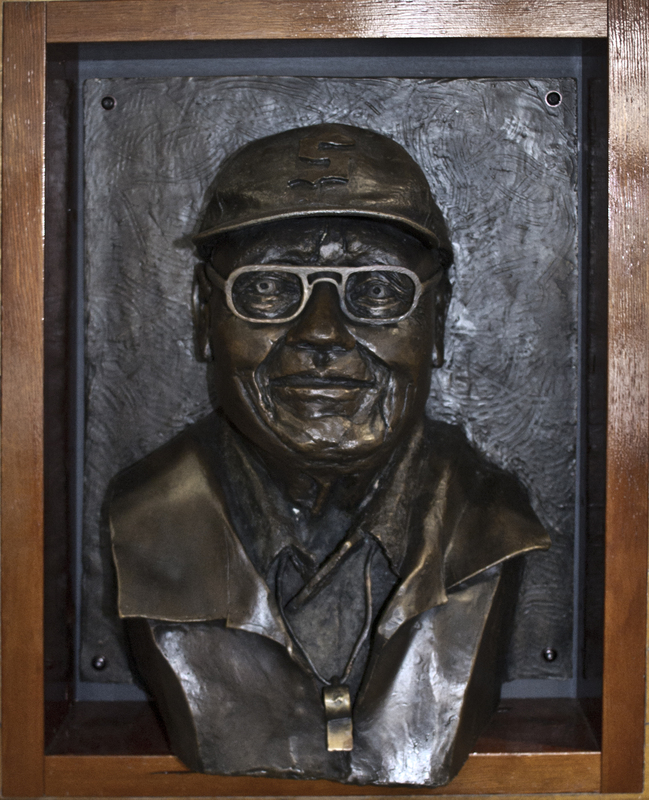 The bronze bust of Keith Gilbertson Sr. has been installed at Snohomish High School to help jump-start a second phase of fundraising to permanently endow a memorial scholarship honoring the Panther coaching icon. Coach Gilbertson, a 1945 SHS graduate, was a teacher for 31 years and coached for 61 years at his alma mater, including the last 30 as an unpaid volunteer, until his death at age 83 in February of 2011. The bust by Seattle sculptor Louise McDowell was commissioned by the Gilbertson family and other friends. 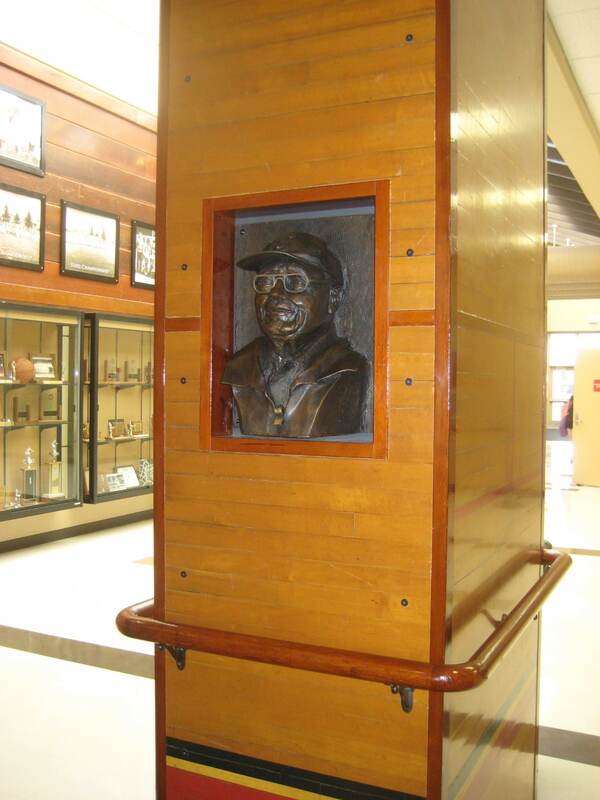 It resides in the foyer outside the SHS gym facing the southwest entrance to the Keith Gilbertson Sr. Sports and Fitness Center, framed in a pillar with wood salvaged from the old B Building gym at SHS, where Coach Gilb and all three of his sons played basketball during their Panther careers. Doug Huntington and Peter Leight did the pillar carpentry work, which also included installation of a handrail from the old gym, which was torn down as part of the school’s recent remodeling. Other wood from the old gym has been used extensively for hall of fame displays and other decorative touches in the current facility.Yet to be added to the pillar are bronze plaques with biographical notes about Coach Gilbertson and career highlights. A formal dedication ceremony for the bust has been scheduled for Friday, Jan. 18, in conjunction with an SHS girls basketball game against Mount Vernon. Coach Gilbertson helped coach the Panther girls basketball teams from 1995-96 until the time of his death. The Keith Gilbertson Sr. Memorial Scholarship, administered by the Snohomish Education Foundation, annually awards two graduating SHS seniors with athletics ties and representing the values Mr. Gilbertson sought to instill in our Panther youth with $1,000 a year for college expenses, renewable each year for up to four years of college. For more images of the Coach Gilbertson bust, click here. To make a memorial scholarship donation honoring Mr. Gilbertson’s legacy, click here. Panther fans or students, athletes and friends of Coach Gilbertson over his lengthy career who honor his legacy with support for the memorial scholarship endowment campaign of $100+ and $500+ may receive a donor recogition plaque to be displayed on the wood pillar housing the bust. Plaques describing Mr. Gilbertson’s Legacy and why he was the Greatest Panther Ever will be installed on the sides of the Gilbertson Memorial column with the donor recognition plaques displayed below them. Every donation from the smallest to the largest is needed to complete the endowment – look to your heart for the difference you should make.